When salted and accompanied by a lime slice wedged on the edge, the Libbey 92315 Aruba 16 oz. margarita glass is in its prime! Featuring a vibrant cobalt blue rim, this color transcends the sugar and creates a radiant, texturized display. This glass's broad top provides a perfect salt-to-drink ratio. Finishing off this unique glass is a matching, brilliant cobalt blue base. 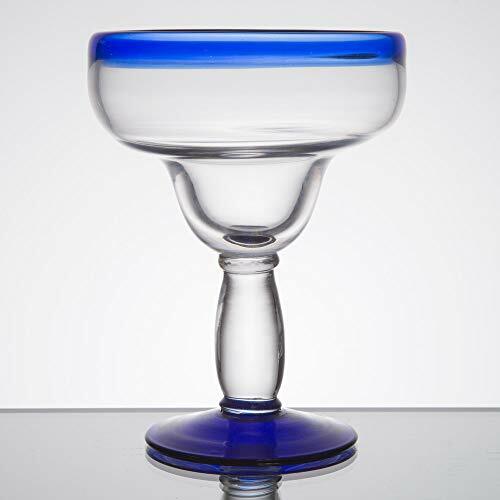 Add this glass to your Mexican restaurant or Cinco de Mayo themed celebration for an eye-catching presentation of your on the rocks, frozen, or straight up margarita! Showcasing a thick stem and base, as well as walls, this durable glass is built to maintain its immaculate appearance for years to come. It can handle your happy hour rush and late night crowd! Additionally, the decorative glass stem provides a landing spot for a patron's hand, ensuring a firm grip on the glass. Since 1818, Libbey has been a leading distributor of glassware, providing a wide selection of durable and elegant products to suit your many needs. In that grand tradition, the high-quality form and feel of this Aruba margarita glass make it a perfect addition to any restaurant, hotel, or bar. Offering unparalleled brilliance and clarity, this glass makes it instantly clear that your customers are receiving the best product and service possible. This product was originally not intended to be sold to consumers in small quantities. Therefore, package sizes and packaging type have not been adequate to be shipped by parcel services. ParcelReady means: the products have been re-packaged to meet the required specifications of parcel services and consumers - this way, there will be less breakage on their way to you! If you have any questions about this product by ParcelReady Glassware, contact us by completing and submitting the form below. If you are looking for a specif part number, please include it with your message.